One of the common questions related to using the millis() function in Arduino, is around timed events. After an event occurs, you want the code to wait for some time before doing the next step. But you don’t want to stop the program with delay(). In this example, we will use millis() to wait a few seconds after a pushbutton press to turn on an LED. Then a few seconds later, we will turn it off. All without using delay(). 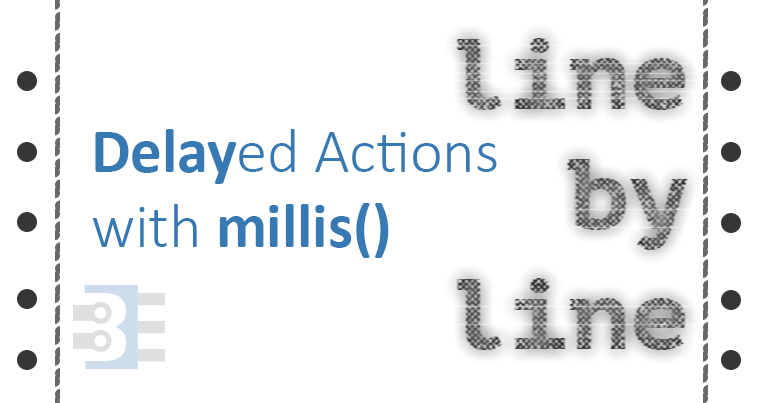 The Arduino millis() function will let you accomplish this delayed action relatively easily. First, read through my multitasking with millis() tutorial and then look at some of my millis() cookbook examples I’ve already posted. Getting used to seeing this kind of code will make this line by line tutorial on timed events using millis() easier to follow. bool ledState = false; // for LED is on or not. // setup our next "state"
These two variables will store the “current” value of millis() when their “event” occurs. Instead of trying to reset millis(), we will compare against itself later on. These two values are arbitrary for this example. It’s how long we wait until we turn on the LED and then how long we wait to turn off the LED. Two flag variables to create the states for the LED. For this simple example, I didn’t create an enum to track the states, but that could have been an option too. ledReady tells the Arduino to wait the amount of time in “turnOnDelay” before turning on the LED. Then it enables the next state, which is waiting to turn off the LED. Nothing unique here. In my circuit, I am using the built-in pull-up resistor on my button pin. Just so I know what state the LED pin is in, I set it to LOW. Remember that loop() runs around and around. So each time loop() starts over, I store the current “time.” Back on the “blink without delay line by line” post, I used the analogy of looking at a watch. That’s what we are doing here, getting the current time. Note: This is where beginners get tripped up. They get focused on the XY Problem of Resetting millis(), it isn’t necessary. Just check to see what time it is! Since the button uses a pull-up resistor, a LOW means the button is being pressed. Keep in mind, the Arduino checks this single if-statement a THOUSAND times while a human being pushes the button. As long as the button is down we are updating buttonPushedMillis with the value in currentMillis. Another option would have been to determine when the button was released, but that would have made the code more complicated. Even if the button bounces a little bit, this code works fine. This flag enables the next “state” which is to wait long enough to turn on the LED. It might seem silly to set ledReady to TRUE and then immediately check to see if it is TRUE. None of this code “stops and waits.” We use this “flag” to let the Arduino know when we are ready to turn on the LED. Standard millis() check. We compare the current value of millis(), stored in currentMillis, to the value in buttonPushedMillis. Keep in mind, buttonPushedMillis will keep getting updated as long as something is pressing the button down. So until you let go of the button, (currentMillis – buttonPushedMillis) is going to be zero (0). The gap between currentMillis and buttonPushedMillis will grow after the button is released. Once it gets to 2500 or more, the if-statement becomes TRUE. Get into the next state, which is waiting long enough to turn off the LED. Just like the button push, we store the time when the LED turned on. Again, we just look at the clock so we can compare how long the LED has been on. If we don’t set this state to FALSE, then ledTurnedOnAt will keep getting updated, and the LED would never turn off. The only similarity between this line and line 32 is that we are still comparing against currentMillis. LedTurnedOnAt and turnOffDelay are specific to this state. Clear the flag that enabled this state. And turn off the LED. That’s it. This code delays turning on the LED after you release the button, and then the LED stays on for a given time. No delay()s, so you could use the code to do other tasks. Look what happens if you press the button again while the LED is on. How long does it stay on? Why? Is there a way to “reset” the on-time each time the button is pressed? I sent you a message that this code was good for my spot welder. The code controls the relay for a time of 200ms. Press once and the relay starts 200 ms with a delay of 5000ms. When I now connect the relay to 220V and I press once, the relay goes 3 to 4 times and sometimes 2 times in a row and then stops. what can I do any idea. Exact circuit and code essential for helpful suggestions. A spot welder is going to be chucking out a lot of RF and other disturbances and your circuit is going to have to be well protected. Sensitive digital inputs aren’t going to like the stuff a welder sends out. I presume you have the basic protection, diode and possibly transistor on your outputs? Tough to say. Could be an EMI problem. Make sure you are switching the “hot” and not the “neutral” connection. (Not sure if that is what they’re called in your region.) You might also consider adding an opts-isolator between the Arduino and relay, if the relay module doesn’t have one already. I want to thank you for the arduino code. I use this for controlling my spot welder via a relay. Sounds cool. Thank you for letting me know. command must be placed only one time in the begging off the loop, or every time when we have two or more buttons in our project ?? . How must be our code when we have two buttons or more , to light two or more leds. ?? Thanks in advance and thank you very mach for your lessons ..
Hello James. I`m struggling to figure how to modify your code in order to make the program to to wait a few seconds after a pushbutton press to turn on an LED. Then a few seconds later, the LED should turn off but while the button is pressed. After the button is released it will make the “same” loop but with other “delays”. I started from your code using flags and state machine but I still don`t figure out, what I`m missing. I don’t follow your explanation or the logic in your code. But I will try to offer some suggestions. 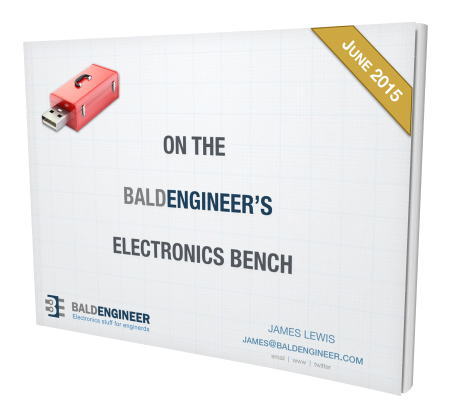 First, you need to be using an external pull-down resistor. Otherwise, your button’s behavior isn’t predictible. Second, you should not be checking “leddReady” or “ledState” twice. You have not created a state machine, you have created a mess. Third, maybe it is how the comment got formatted. But you would do yourself a HUGE favor to hit “ctrl-t” in the IDE. It will format your code so that it is readable. Hello sir James.I am beginner with arduino.I would like to ask you how can we turn off the led not only with the expire of time (delay of 5 sec) but also with the same push button before the expire of 5 sec.I want to have 2 choices.Either by pushing the button so the led turns on and waits for 5 sec in order to turn off or by pushing again the button before the expire of 5 sec,so it will turn off immediately . Sorry, but I won’t write your projects logic for you. Use the examples to solve the two states you want by themselvds: count up and count down. Then the push buttons can set flags that use that logic. Change line 23 to look for a HIGH. // store the current value of millis, which "resets" the timer. Thank-you, Thank-you, Thank-you!! I am trying to learn Arduino while working on a project. I have the project working using old school hardware mainly based on mono-stable 555 timers. But then I decided to add a color display to serve as an object counter and Arduino was the best way I could think of to do it. Since I was going to add a pro-mini for the display I figured it would only make sense to do the whole thing with the Arduino. Once I had the counter/display working I tried to add the other functions that were being handled by the 555s. That’s when I quickly learned that using Delay wasn’t going to work. I’ve been trying to figure out how to implement Millis() for a week or more and just wasn’t getting anywhere. I wasn’t even sure Millis() was the way to go about it. I finally found this tutorial and at 1st thought it might work with a few changes. Then I realized that it was verbatim exactly what I was looking for. I ended up changing pin assignments and renaming the variables to reflect my project but otherwise I just copied your sketch. Now that i see how it is done I realize my attempts weren’t even close!! You have gotten my project past a major hurdle. It now runs simultaneous with the counter and i can move on to other aspects. In the meantime I will be studying this sketch (which I now call the 555 timer sketch lol) until I understand the reason for each line. You put a big smile on my face today. Thank-you again. So in my case I am turning on a relay from a web interface button (to open a garage door) but I want it to stay on after I “unclick” the button for 500ms to make sure the contactor on the motor has time to pull in. Can I compare the time from when the button was pressed (openTime) to millis() + 500. Is there a reason this won’t work? I ran it and it does not seem to be working but I’m wondering if its a syntax error. Code snippets rarely contain the actual problem. #1 What variable type is openTime. It needs to be an unsigned long. #2 The if-statement needs to be called inside of a loop. You can’t check if 500ms has passed, unless you keep looking at it. does the “check the button” image misleading? seems like it is missing a supply and resistor. What if you wanted to change this code so that it starts the timer as soon as the button is pressed instead of released? In my case, a switch will turn on and stay on for the entire loop. I want the LED to turn on as soon as the switched is set HIGH. You would just need to follow the button state change example on arduino.cc. In the if-statement, check to see if the button is ON (HIGH or LOW depending on your situation) and then set the ledReady to true. This doesn’t seem to work correctly. Need it to turn the LED on for 3 seconds as soon as the button is pressed, and then off – although the button will remain pressed until reset. I don’t have time to look in depth, but add an AND statement to your button check to ignore it if co2ValveReady is true. There’s no reason to check the button at that point (and you keep updating the buttonPushedMillis) in that case. I amend code to blink when you press button and at the end of setup time, but when ever you press button within this time led is blinking again and I want to switch it off this behavior. I would create a flag called “isBlinking”. When the timer runs out, set it to false. If the button is pressed and isBlinking is true, set it to false. How you can disable led blinking every time when you press button with in turnOffDelay? I don’t understand your question. I guess you need to create a flag variable for LED-blinking. Can be the possibility of millis() roll over if the arduino is left ON for enougth time ???? Yes, of course. It rolls over about every 49 days. This code is specifically written to handle the rollover. This article discusses how this rollover handling works.